Lewis Falls plunges 81 feet over a rock ledge and is one of the most beautiful waterfalls in Shenandoah National Park. How much water is flowing over it depends on the time of year and amount of recent rainfall, but it’s a nice hike to do at any time. This is a 3.3-mile loop trail that follows the Appalachian Trail for a large portion of the hike. 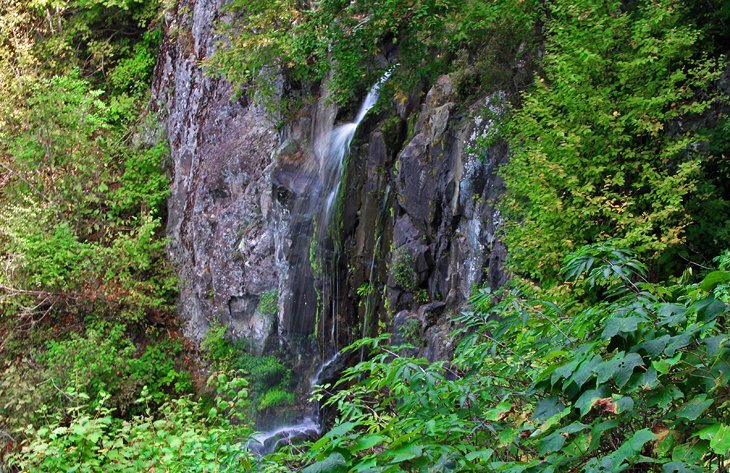 The main feature is Lewis Falls, but there are also nice views along the trail in some sections. Portions of the trail are rocky, uneven, and steep in some areas. Near the Byrd Visitor Center at Big Meadows, the hike can be started at the Big Meadows campground amphitheater or at the Tanners Ridge Overlook, just south of the visitor center on Skyline Drive. If you start at the Tanners Ridge overlook, you have the option of stopping off for lunch at the Big Meadows Lodge for a mid-hike break. If you are not interested in doing the full loop and simply want to see the falls, begin at the Tanners Ridge overlook and do an out and back hike to the falls. From here it is a 0.9 mile downhill hike to the falls, and returns following the same route, for a 1.8-mile round-trip.